When I taught at Meadow Creek Christian School (now Legacy Christian Academy) I often attended an early morning bible study led by John Ferret, one of our instructors who was an incredible follower of Christ with a passion for studying the Hebrew roots of our Christian faith. One morning he was telling us about how he prayed: alone, in the morning, wrapped in a blanket to symbolize being wrapped in the arms of the Lord. It was an image and practice that has stuck with me over time, and ten years later I still try to make this part of my morning routine. I miss days every now and then, but most mornings after I get out of the shower I spend about ten minutes looking out on our back porch (often with a blanket wrapped around me) and pray. It’s a simple practice that has made an enormous difference in my walk with the Lord over the years, and is also a really nice way to start the day by praising my creator, praying for my family and friends, and laying any burdens at His feet. On the morning I took this photo the whole town was covered in a layer of dew and mist thanks to a healthy dose of rain from the previous day, and as I stared out the window I saw tiny spots of light on our metal fence surrounding the porch. Our neighbor’s outdoor light was shining just enough to reflect off the twists in the metal, so after my prayers I grabbed my D200 + 50mm combo along with my tripod and stepped out to get a photo. I knew exactly the type of picture I was aiming for, though it was kind of difficult because there was almost no light by which to focus or even compose the shot. Things might look bright in this photo, but this was a 20-second exposure at f/1.8, ISO 200. In reality things were so dark I couldn’t even see well enough to focus manually, and my camera had no chance of nailing focus automatically. And with each exposure taking 15-20 seconds it added a significant amount of time to what would have been an otherwise very simple photo. 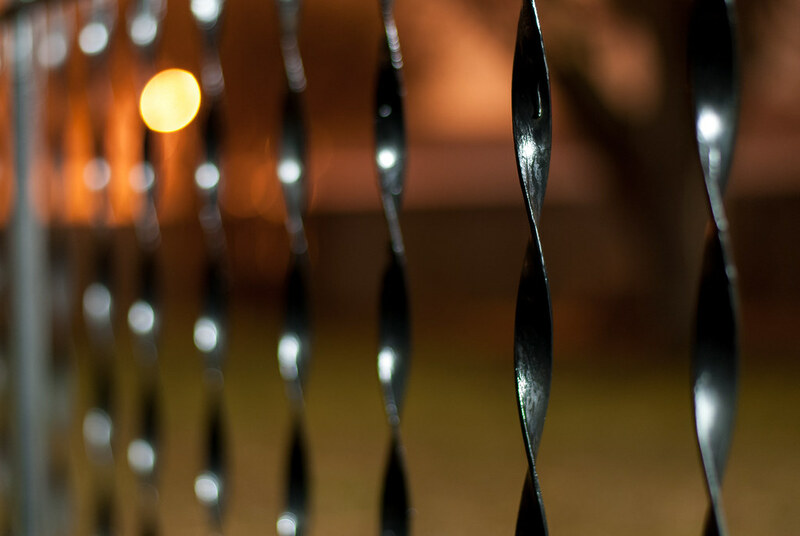 I ended up clipping a clothes pin to the section of fence on which I wanted to focus which gave the autofocus something to work with, and also positioned my camera in such a way as to get a dim street light in the frame as well, which resulted in a pleasing glow in the top left corner. Very interesting to read/hear how you captured this shot, Simon. I am always fascinated by the use of light in photography, and I really like how you used it here, it turned out great. Fun to remember John Ferret, I’ll have to click on the link and see what he’s been up to. I love the idea of wrapping oneself in a blanket during prayer to symbolize the arms of the Lord around you, what a wonderful practice! Thanks for the photo and especially for being willing to share your faith with your work. Not common in today’s world. Nice photo! Enjoyed hearing how you went about capturing it. However, I must agree that the most important thing that you presented was taking time each day to sit down and pray to our Lord and Savior. Doing so early in the morning is a great way to start the day. Thank you, David. I never quite understood how important it was to begin my day in prayer until I started doing it on a regular basis. It really does make a big difference. Beautiful! And sometime many years from now, I hope this photo will help you remember the journey you’ve walked with the Lord. We capture our memories of our family, etc., but it’s neat to think about capturing our spiritual journey also. Thanks for sharing. Thank you, Shannon! And I like what you said about capturing our spiritual journey. That would be an interesting photography project: take photos that illustrate your relationship with the Lord. I wonder what that would be like to do, and then (as you said) look back on years from now.